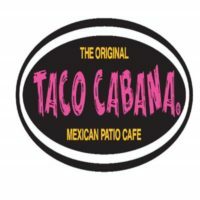 Taco Cabana is a chain of fast casual Mexican food restaurants with locations in Texas, Oklahoma, and New Mexico. The restaurants serve fresh food, made to order in open kitchens while customers watch. They offer indoor and al fresco dining. You can find a link for a Taco Cabana application at the bottom. The business was founded in 1978 by Felix Stehling in San Antonio, Texas. He and his wife, Billie Jo Stehling, purchased a closed Dairy Queen and converted it into a taco stand, using the outdoor eating area that was already there. Because all of the patio furniture was stolen after the first day of business, he decided his new restaurant would be open 24 hours. The chain is now a subsidiary of Fiesta Restaurant Group, Inc., which also owns the Pollo Tropical chain of restaurants. Fiesta Restaurant Group is publicly traded on the NASDAQ as FRGI. Its CEO and President is Timothy P. Taft. Taco Cabana now has 166 locations and employs over 4000 people. The restaurants serve fajitas, tacos, burritos, enchiladas, flautas, quesadillas, and nachos. The offer sides, and desserts, and have special menus for breakfast items and kid’s meals. The chain serves beer and margaritas in addition to soft drinks. To apply online for an in-store position, go to the website, answer some questions, and fill out an application form. The company posts corporate career opportunities at its website as they become available. If your desired position is not available, you can sign up for a waiting list, and you will be contacted when they are hiring. If you wish to apply for a corporate position, you can upload your resume with a cover letter through a link at the website. The company has plenty of in-store jobs available. You can follow the online application process at their website if you are interested in working as a Shift Leader, Cashier, Host or Hostess, Cook, or Line Server. You would work as a team member at the grill, or up front as a server. How old do you have to be to work at Taco Cabana? You must be 16 to work at Taco Cabana. The business sells alcoholic beverages. You must be 18 to serve alcohol in Texas or Oklahoma. In New Mexico, you must be 21, or obtain a permit to sell alcohol if you are 19 or 20. Underage employees will be limited in the positions they can fill. Benefits of entry-level Taco Cabana jobs include vacation time, employee discounts, and opportunities for advancement. Managers and corporate employees receive an attractive benefits package that includes bonuses, health and life insurance, 401(k), paid days off, tuition reimbursement, and food discounts. Many, but not all, of the restaurants are open 24 hours. Hours are not posted online. You can get contact information for your local store at the website. Cashier – As a Cashier, you would ring up orders cheerfully and accurately. You would need to meet your state’s age requirements to sell alcohol to work this position. Prior experience is not necessary. Pay starts at minimum wage, but can be as high as $9.00 per hour, depending on experience. Cook – The Cook prepares fresh food from scratch in an open kitchen area that is visible to customers. Cooks keep the kitchen area spotless, and make sure the ingredients are fresh and properly stored. This is an entry-level position, and is open to sixteen-year-olds. Pay ranges from minimum wage to $9.00 per hour, based on experience. Shift Leader – As a Shift Leader, you would make sure everything is ready to go at the start of your shift, lead Team Members during your shift, provide excellent customer service, and take on the role of Manager when a Manager or Assistant Manager are not present. You would need six months or more of experience. This position pays up to $11.50 per hour. Assistant General Manager – The Assistant General Manager’s responsibilities are to direct daily operations and employees in the restaurant under the guidance of the General Manager and the corporate policies. This position requires two years of restaurant management experience. Many in this position were promoted from entry-level work in the company. Salary is around $30,000 per year, plus benefits and bonuses. How well can you work under pressure? The restaurants are busy, and the pace is fast. Your interviewer wants to feel confident that you are energetic and will be able work efficiently and not become impatient with others when it’s busy. There is no printable application for Taco Cabana, but you can apply online. Do you like working with people, or would you be more comfortable in the back? If you are applying for one of the team member positions, you may be a better fit up front, dealing with the customers, or in back, dealing with the food. Try to give your interviewer an idea of where you would do your best work. If the refrigerator is supposed to be kept between 35 and 45 degrees, and you discovered it was 47 degrees, what would you do? Sometimes problems arise. If you are applying for an entry-level position, you can answer that you would report it to a manager. If you are applying for management, your answer would need to show that you take food safety very seriously. What is your availability? Many of these eateries are open 24 hours. People will be needed to work at any time of day. You’ll want to discuss what kind of shifts they might want you to work. You should also tell them if you have any other obligations, such as school. How old are you? You must be at least 16 to work for this company. Since some positions have a higher age requirement, your placement with the company can be affected by your age. This question is only appropriate to ensure that you are old enough to work at the company or in a specific position. If you want to how to apply for Taco Cabana online, go to their website through the application links below. You will have to fill out a pre-employment questionnaire before you will be able to browse careers, read a job description, or fill out a Taco Cabana application. You can apply for jobs at Taco Cabana by direct application once you do. The online application process for Taco Cabana careers at the corporate level will require you to upload your resume and cover letter, detailing your experience working in the industry. You will not be able to download application form. If no jobs are currently available, you can go on a waiting list to be informed of new job opportunities as they arise. While there is no printable application form for Taco Cabana jobs, you can fill out applications for Taco Cabana jobs online. Follow the instructions at the careers page. Corporate candidates will be asked to upload a resume. Hourly and management applicants will be directed to begin separate pre-employment interviews as the first step in the free application process.